The De Hoop Reserve is a safe, outdoor destination with almost year-round sunshine. Children of all ages will relish the freedom to explore the reserve. The endless beach, towering sand dunes, inter tidal rock pools and diverse fauna and flora provide a natural playground for kids to learn. 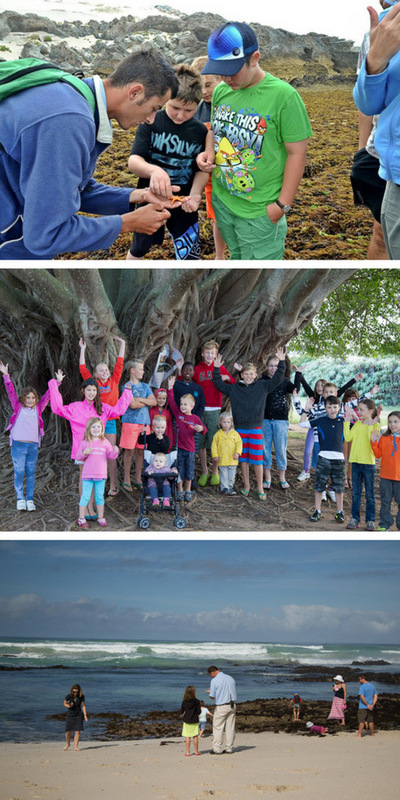 There is plenty to do in De Hoop and guests are spoilt for choice – your stay at De Hoop will only leave your family wanting more – a truly “family friendly” retreat to spend quality time with your loved ones. De Hoop is the ultimate wildlife education for the whole family and has a wide range of accommodation. From affordable self-catering chalets to more luxurious self-catering cottages and upmarket fully catered lodges, there is something for every family. School Holidays: Check the daily activity board for fun things to do for the whole family. Day visitors are welcome at De Hoop and guests may leave their vehicles at any time to walk or cycle anywhere in the reserve as long as they take care not to trample the natural vegetation. Birding, hiking, mountain biking and snorkeling are rewarding activities. The Fig Tree Restaurant is open all day offering delicious local fare including picnic baskets for alfresco meals. There is a tennis court at the Opstal area – bring your rackets or hire them. The Opstal has a swimming pool and there is also a boules court – there is a boules set but if you have one, do bring it.